Temple arrangements: A great tomb is in the solar West, with a veil covering its opening. Inside the tomb is a table or altar, at least 6' long, running from north to south. In the solar East, a large altar is elevated upon a dais of three steps. The altar is clothed with red, with black flowers surrounding a great graal filled with absinthe (chartreuse and soda is an acceptable substitute). Thirteen candles burn above the altar, which also may be set with images of Apep, Sebek, Typhon and Set. Two double-cubes are in the Southeast and Northeast, attended by officers Bull (in black) and Virgin (in white), respectively. The Virgin has a dagger, the Bull has a chain and a scourge. Officer Magister Templi in black and green, wearing a black fez or kufi, and blindfolded, is within the tomb, standing in front of the altar. The people are admitted, and stand along the North and South sides of the space. Bull strikes the dais with the scourge three times. Virgin makes a cross upon the people with the dagger, and says: The spirits are hungry and the walls are thin. Do what thou wilt shall be the whole of the Law. All answer: Love is the law, love under will. Bull: Let us devour the sun! Virgin: Can that be accomplished? Bull: The Master of the Temple has done it. Virgin: Let us seek his aid. Bull and Virgin advance to the tomb. Virgin cuts down the veil with her dagger. Bull makes the sign puer toward the opening of the tomb: He is in sorrow, and stillness, and silence. Bull stands at the side of the tomb in the sign vir. Virgin makes the sign puella toward the opening of the tomb: Share with us thine understanding, o ancient one. Virgin stands at the other side of the tomb in the sign mulier. They hold these signs during the following speech. Threefold is the Nature of Life, Eagle, Serpent, and Scorpion. And of these the Scorpion is he that, having no Lion of Light and of Courage within him, seemeth to himself encircled by Fire, and, driving his Sting into himself, he dieth. Such are the Black Brothers, that cry: I am I, they that deny Love, restricting it to their own Nature. But the Serpent is the secret Nature of Man, that is Life and Death, and maketh his Way through the Generations in Silence. And the Eagle is that Might of Life which is the Key of Magick, uplifting the Body and its Appurtenance unto high Ekstacy upon his Wings. It is by Virtue thereof that the Sphinx beholdeth the Sun unwinking, and confronteth the Pyramid without Shame. 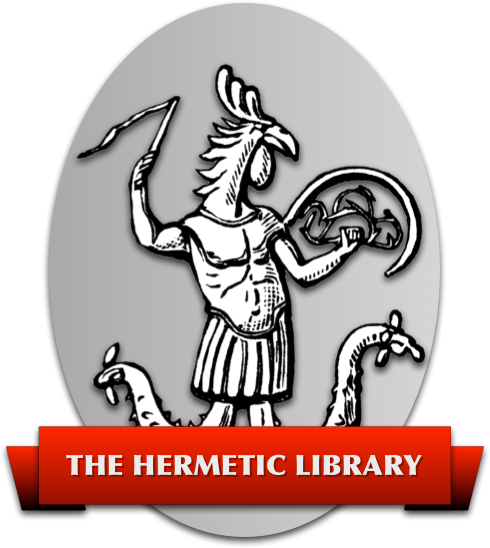 Our Dragon, therefore, combining the Natures of the Eagle and the Serpent, is our Love, the Organ of our Will, by whose Virtue we perform the Work and Miracle of the One Substance, as saith thine Ancestor Hermes Trismegistus, in his Tablet of Smaragda. And this Dragon, is called thy Silence, because in the Hour of his Operation that within thee which saith “I” is abolished in its Conjunction with the Beloved. Bull: Is it thus that the sun is devoured? Virgin: What darkness must result? Magister Templi: In all the universe darkness is only to be found in the shadow of a gross and opaque planet, as it were for a moment; the universe itself is a flood of light eternal. So also death is but through accident; thou hast hidden thyself in the shadow of thy gross body, and taking it for reality, thou hast trembled. Bull and Virgin assist Magister Templi to proceed to the space between the double-cubes, to which they return. Bull: Mysterious Energy, triform, mysterious Matter, in fourfold and sevenfold division, the interplay of which things weave the dance of the Veil of Life upon the Face of the Spirit, let there be Harmony and Beauty in your mystic loves, that in us may be health and wealth and strength and divine pleasure according to the Law of Liberty; let each pursue his Will as a strong man that rejoiceth in his way, as the course of a Star that blazeth for ever among the joyous company of Heaven. Virgin: Unto them from whose eyes the veil of life hath fallen may there be granted the accomplishment of their true Wills; whether they will absorption in the Infinite, or to be united with their chosen and preferred, or to be in contemplation, or to be at peace, or to achieve the labour and heroism of incarnation on this planet or another, or in any Star, or aught else, unto them may there be granted the accomplishment of their wills; yea, the accomplishment of their wills. AUMGN. AUMGN. AUMGN. Magister Templi crawls up the steps of the dais, stands before the altar: Arise, O serpent Apep, Thou art Adonai the beloved one! Thou art my darling and my lord, and Thy poison is sweeter than the kisses of Isis the mother of the Gods! For Thou art He! Yea, Thou shalt swallow up Asi and Asar, and the children of Ptah. Thou shalt pour forth a flood of poison to destroy the works of the Magician. Only the Destroyer shall devour Thee; Thou shalt blacken his throat, wherein his spirit abideth. Ah, serpent Apep, but I love Thee! He takes the graal in hand, turns, and displays it: This which thou seest is called the wine of death! Bull holds the Magister Templi's wrists behind him, with the chain wrapped around them. Virgin places the dagger against the Magister Templi's breast, and gives him to drink from the graal. Magister Templi: Ah! Messenger of the beloved One, let Thy shadow be over me! Bull and Virgin release Magister Templi, and he falls to his knees. They assist him to rise and return to the Tomb in the West, wherein the Bull lays him out upon the altar, head southwards. The Virgin brings the graal from the eastern altar, and stands it upon the solar plexus of the Magister Templi, who clasps its base. Bull: Do what thou wilt shall be the whole of the Law. Bull whispers to Virgin: Earth and its joys are but as shadows. Virgin takes the graal from the Magister Templi, drinks from it, replaces it, and whispers to Bull: There is no limit to the light. Virgin takes one of the people by the left hand (seizing left-to-left, as though in a handshake), brings that one to the tomb, and whispers to that one: Earth and its joys are but as shadows. Bull indicates for that one to take the Graal from the chest of the Magister Templi, and to drink from it. Bull whispers to that one: There is no limit to the light. Bull takes the graal and returns it to the Magister Templi. Virgin returns the communicant, and brings the next, with the same procedure. They repeat until all have drunk. Virgin returns and whispers to Bull: Earth and its joys are but as shadows. Bull takes the graal from the Magister Templi, drinks from it, replaces it, and whispers to Virgin: There is no limit to the light. Virgin closes the veil of the tomb. Bull gestures to describe a great sigil of Scorpio towards the people, saying: Now may the light sanctify you entirely; and may your spirit and soul and body be devoured complete, at the coming of the mighty Dragon. They exit, and the ceremony is concluded. HOIRH VHQITzH LMShPTI ALHI VADNI LRIBI. Ha-i-ra v'hakitza lamishpautai elohai v'adonai lereevee. ChMTh ThNINM IINM VRASh PThNIM AKZR. Chamat tininim ienam v'rosh petinim achzor.